When drafting federal law, the most important audience is the federal courts–in particular, the Supreme Court. Fortunately, it is not difficult to get inside the mind of the Court and understand how it thinks. The Court makes this process public in its published opinions; collectively, the process is known as statutory interpretation; it is also known as statutory construction. 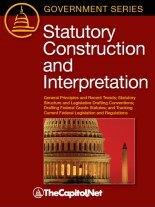 Legislation can be drafted without paying attention to statutory interpretation. But rules of interpretation are like rules of the road: Drive on the right; stop on red; signal before turning; etc. If you don’t know all the rules, sooner or later you will park in front of a fire hydrant or go the wrong way down a one-way street. Our training courses, publications, and audio courses include congressional operations, legislative and budget process, communication and advocacy, media and public relations, testifying before Congress, research skills, legislative drafting, critical thinking and writing, and more.